Susybee or,Susy Bleasby has made her mark in the world by creating a whole world of silly and loveable characters, then painting them wall on murals. Now she brings us Lewe the Lamb. 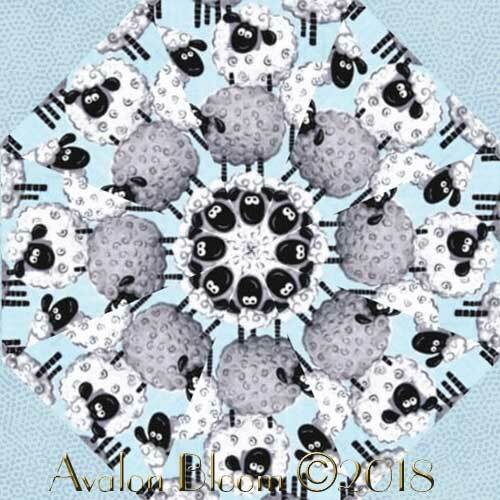 This design is covered with sheep on a light blue background. Colors include blue, black, grey and white. 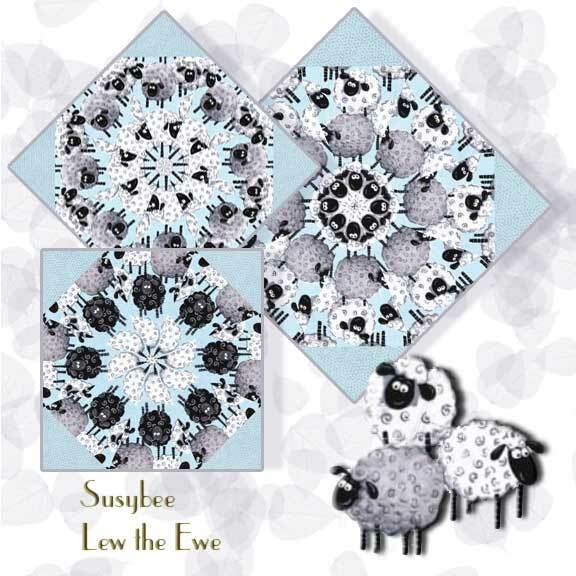 Lew the Ewe by Susybee for the Hamil Group pattern SKU: #SB20230-710. The precut corners are included. This is a precut kit to sew a set of 12 kaleidoscope quilt blocks. Each block measures 8 1/2 inches square when sewn.Finished dimension for all blocks sewn together is 24 X 32 inches Our Fast and Easy Blooming Blocks© are cut from 100 percent cotton fabric. Each block in the set will be uniquely different due to layering the fabric in exact repeats to create a kaleidoscope effect by precisely rotary cutting them.They are specially cut so that the centers will lie flatter and so there is no bias on the edges of the block so they lie flat in your quilt. You can put these blocks together in a quilt in different ways. Illustrated instructions included to complete the blocks that even a beginner can understand as well as bonus instructions for dimensions to include these blocks in a King, Queen, Double, Twin or Baby Crib, wall hanging quilt as well as a Table Runner or Placemats.